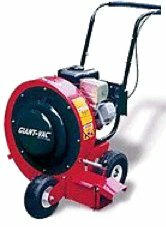 Giant Vac blower is a company with a long history, dating back to the founding in 1948 by renowned engineer H.L. Diehl. Over the years, a variety of products were developed with one thing in common - quality and reliability. The company thrived through the years, and in the year 200, the Simplicity company purchased Giant Vac. In 2004, Briggs and Stratton acquired Simplicity, as well as the Snapper, Ferris, and Murray brands. The Giant Vac Leaf Blower lineup starts with the Classic. The name suits this beauty well. It is powered by an 850 series 9 HP engine, which powers a 15 inch impeller held in place with bolt-on hubs. This baby will throw 1700 CFM (cubic feet per minute), with a front or side discharge control. The front wheels are standard solid wheels, while the rear wheels are pneumatic turf safe, with grease fittings for longer axle life. Curb weight on this wind machine is 115 lbs.The price for this basic homeowner machine is about $585.00. Next in the Giant Vac Leaf Blower lineup is the Extreme Classic. As the name implies, several upgrades are present, to include a 900 Series 9 HP Briggs engine.The 15 inch impeller is of the improved permanent mold aluminum, with a taper lock hub. Vibration is reduced with the use of iso-mount handles. Wheel upgrades include pneumatic turf safe tires front and back. The CFM (cubic feet per minute) is increased to 2420, with a weight of 165 lbs. The better engine on this wind maker raises the price to $785.00. The Giant Vac Extreme carries more features (and higher price) than the Extreme Classic. The engine is a 1450 Series 9 HP Briggs engine, nestled in a 10 gauge welded steel frame. The impeller is 15 inch permanent mold aluminum, with a taper lock hub. The handles are again iso-mounted, with “No Flat” turf safe rear and front wheels. Grease fittings are present all around. As is standard with all the Giant Vac blowers, discharge is adjustable from front to side. CFM is 2500. Plan on spending $1020.00. Finishing off the Giant Vac leaf blower line is Extreme Pro. This big daddy is powered by a 9 HP Vanguard Briggs engine. With a 10 gauge welded steel frame. The impeller is again 15 inch permanent mold aluminum. The handles are iso mounted, with a rating of 2550 CFM. No-Flat turf safe tires are in the front and rear, with an adjustable discharge out the front or side. All that power costs more money - about $1090.00, to be exact. Giant Vac makes one great machine. No matter what your budget can afford, you will not be disappointed with this brand of blower!